Our family member and friend, Kevin Crosser, was involved in a horrible accident on the night of August 20, 2009. This blog is to chronicle Kevin's journey that has begun since. Trepidation, anxiety and excitement. That's what fills our thoughts tonight as we go to bed. Tomorrow (Tuesday) morning we have an appointment to see Kevin's pulmonologist when she is supposed to remove his trach. Tonight he went to bed with it and tomorrow he will not have it barring any unforeseen circumstances. I supposed these are the kind of thoughts that anyone has whenever something you have waited for has finally come. In fact, I remember the feeling distinctly as we found out each time that things were in order for us to leave to Italy. I remember the very first time it took one year and ten months for us to raise enoug monthly support and get our legal permission in order to leave for Italy. I remember having mixed emotions of being excited for the next leg of the journey, but wondering if we were really ready for it. God was always there even if we felt unprepared. We were heading into the unknown with nothing more than faith that God would do what he had said in his word he would do. Kevin has had his trach for exactly one year and nine months and three days. We have had to learn how to take care of his trach, knowing when to use the suction catheters and when not to, how to clean the inner canula (twice daily) and care for his skin around it all. We have become experts in something in which we didn't care to know. And now it's changing. We are excited for sure though. Cautiously excited. Having the trach out means we hear more of his natural sounds. The past several days that Kevin has been capped we have heard his natural clearing of his throat more, snoring at night and other sounds that we don't normally hear coming from him. How will this change future speech therapy? There will be more focus on swallowing. He may be able to produce sounds easier or new ones altogether. At some point, we may starting feeding him by mouth. He may have less chance of feeling gagged, less sucretions, less potential for sickness. All that doesn't take away the hurdles he faces. But we’ve been here before. Standing in the face of the unknown. Tomorrow I hope to write that everyting went great. The procedure painless and smooth. But we don't know what tomorrow looks like. It's unknown. What we do know is that God will be there for us tomorrow, like he has been for every step of our lives. He is greater than any temporary momentary troubles we face on this earth and there is a much larger message that needs to get out to the world. Thanks for indulging me as I work through my thoughts before heading to bed. He's sleeping now, but I'll give Kevin a kiss on the forehead for you. Update #138 on Kevin - Trach Coming Out! ...two days after returning home we had a circuit breaker fire that displaced us for three weeks. Greg gladly opened up his home to the five of us (Matt, Angie, Jacob, Kohl and Kevin!) plus nurses round the clock. The house had to be restored due to smoke and odor damage. ...I had bronchitis and shingles for a few weeks; meanwhile Kevin never seemed to get over whatever he had that took him to the hospital. ...came back home for two weeks and Kevin got bad again. It wasn't as bad as when we took him to the hospital in February, but bad enough to go again. So we took him once more to St. John's ER. They admitted him for a week. They were never fully sure what was going on, maybe pneumonia, but weren't sure. Brought him home on April Fools' Day. ...April was a great month for Kevin at therapy. He was more alert and doing things he hadn't done since December. But the previous few months hadn't been good due to sickness so his charts looked bad. You can really chart that the reason he's not doing good was due to sickness. So the outpatient therapy we were taking him to had to discharge for now. ...May 2, Kevin seemed to be showing similar signs to when we took him to him to the ER, so we headed that way. They ended up treating him in the ER that day and sending us home with meds for bronchitis. That seemed to do the trick. ...In the May, Kevin had an eye infection, but with some antibiotics it's already cleared up. ...Since around the middle of February, we have had approval for twenty-four around the clock nursing. However, we haven't but maybe one week where we had that fully staffed. There have been many different reasons why, some were nurses getting sick or in car wrecks. But suffice it to say, we still need competent and dependably committed nurses to fill shifts. It means constant training and reworking of our schedules. Most of the empty shifts fall to Angie, which is incredibly hard at times. ...of course during all this, we have continued therapy at home. Now that the weather is nice we can take Kevin outside on the deck which was graciously built by United Way volunteers and some of Kevin's friends. It and the other developments they made have been a great benefit going into the outdoor season. ...Kevin's trach has been being capped throughout the day. On our last visit with the pulmonologist (lung doctor) she wanted us to be more aggressive with capping him throughout the day. We had slowly been working him back up to where he was before he started getting sick around the beginning of the year. She said let's aggressively add time each day that he does well. Because she believed he could do it, and so did we. ...This week we have been adding more and more time every day working toward a full twenty-four hour period of capping. His pulmonologist said if he got to twenty-four hours then we could take the trach out. He just did that! In fact, he has had it on for more than twenty-four hours now and still doing great. This morning Angie heard him naturally snoring, because his airway is totally through his nose and mouth when capped. ...We called the doctor and left a message. She called back soon and said let's take the trach out! We can either do it with a nurse or bring him in on Monday. We are discussing it and determining which way is best. Either way, his trach is coming out! ...We'll note something, for sure on twitter, when it comes out. You can read the tweets at http://twitter.com/pray4kevin. ...Remember you can fill out a letter online and send it to Kevin at http://bit.ly/note2kevin. It will be printed off and read to Kevin. Thanks for your thoughts and prayers. This is a big step for Kevin's recovery. We give God all the glory for getting Kevin to this point. Update #137 on Kevin - Back at Home! We were able to bring Kevin home last night. He stills needs to rest and continue to recuperate but he's doing so much better. He also got some redness and a slight sore while at the hospital so we are taking great strains to heal that through application of medication and consistent turns every couple hours. At this point he can't stay in his wheelchair for more than a couple hours so that he isn't stressing the already tender skin. Our home health care agency has been trying to staff the house with 24 hour nursing. We are hoping that this can continue for the unforeseeable future since it has been difficult to give the best of care with only 8 hours of nursing. We won't know about approval for how much nursing we will get for a week or so, but right now they are trying to staff us with as close to 24 hours as possible. For instance, tonight from 10PM -8AM we don't have anyone and tomorrow from 4PM - 8PM we don't either, but the nursing agency is doing their very best to fill all those slots. Part of the process, for whatever amount of nursing we get is having new nurses. That means lots of training and teaching for how things work at this house and what Kevin needs. Also, right now everything Kevin is getting (medicine, food, care) is spread out over the entire 24 hours to ease him back into things. That means the few breaks we worked into his schedule are gone. Every two hours he is turned (takes about fifteen -twenty minutes), food is every four hours, breathing treatments are every four hours, eye ointment is every two hours, etc…….. Little rest in between and it makes a big difference that we have more nursing right now. We pray it will continue. If you want to send a message to Kevin, I took an idea from the hospital and added it to his website (http://www.prayforkevin.com/). All you have to do is click this link to send a note to Kevin http://bit.ly/note2kevin. We'll print it off and read it to him. This way Kevin can hear from you even if you can't come by and see him. And if you would like to come by and see Kevin, please try. We know he would love it. Thanks for all the love and messages at the hospital. Outside of all the emails, facebook messages, and comments we had over thirty St John's "Well Wishes" emails hanging on his wall before we left! It meant so much to us and him. Thanks so much for your prayers during this difficult time during Kevin's already difficult recovery. Your prayers are heard. So, here I sit in Kevin's room listening to Jazz and waiting for the doctor to come in with news that we can take Kevin home today. It's 11:15 AM and she has usually come in around 9:30 AM, therefore anticipation is building. Kevin has remained great on room air for two days. He's been off antibiotics for a couple days. All his testings have come back with good results. He does have a small sore that is right on top of a scar from one of his old ones. I have the nurses doing "extreme" side turns so that he does not put any more pressure or moisture on the spot. They've pulled unneccessary catheters from Kevin and he's doing good and regulating things on his own. All that's left is a picc line which they will remove towards the last minute. As far as the pressure spot goes, I will argue that for fourteen months he has had none at home. When he first came home, there were two pressure sores that were healed within about two weeks. At home we only have one "patient" to monitor. So, even if he goes home with it, the hope is between good care, the circulating air mattress and meds he will bounce back from that too. The pulmonologist came in earlier, commented on my Coltrane playing and stated that he didn't see any reason why Kevin's main doctor in this unit wouldn't let him go home today. Angie stayed at the house last night and has cleaned like a banshee in order for it to be ready if we bring him home today. I stayed with him at the hospital and helped the nurses get him far on his side for pressure relief. We have thirty well wishing emails that you all have sent and after being read to Kevin are hanging on the wall in his room. When I read him some yesterday, he opened his eyes bigger, turned towards me and listened. Thanks for encouraging Kevin and us. Many staff have commented that they didn't even know they had this on the St John's website and they thought it was so cool that we have them hanging in his room. As soon as we get the discharge info, we can get it to our home health care agency, Maxim, and they can request approval for nursing. Because he needs round the clock care we are requesting twenty-four hours per day nursing. Insurance has only paid for eight hours per day so far, but then again, many of you are praying. Our God is bigger than any insurance company's policy! It's 11:45 AM and still no doc. The Jazz relaxes and calms me. A couple other nurses came in and loved the Ella Fitzgerald and Nina Simone that was playing. Now, hopefully we can listen at home tonight. Now one of my favorites, the Girl from Ipanema (Stan Getz version). If you still want to send an email message to Kevin, just go to http://www.sjmc.org/ and click "contact a patient" on the right side, the form will pop up. Do it soon, in case we get to go home this afternoon. Update #135 on Kevin - Out of ICU! So, more good stuff to report. After waiting all day, Kevin finally got his MRI's late last night. The hospital is really full here, so he kept getting bumped for more urgent cases. Then around midnight, Kevin got moved to a new room out of ICU. He is on the same floor in room 845. It's a private room with great nurses and aides so far. Today they pulled him off oxygen because he was doing so well and has been on humidified room air ever since. I spent the night here with him (the nurses encourage it in this wing) and Angie went home to sleep. Tonight we are tagging out. I'll go home and Angie will stay in the room. When Angie came up today she brought Kevin's wheelchair. This afternoon the nurses put Kevin in his chair. We wanted to start it out slow, so it was only for 2 1/2 hours but Kevin did great. We are making arrangements with home health care because they are still looking at Kevin going home later this week, probably Friday. We hope to have more nursing in place so please pray for more than eight hours to be approved. Feel free to keep sending messages to Kevin through the St John's website. We have read every one to him and hung them on the wall in his room. The link is http://www.sjmc.org/general.asp?id=322&siteuse=11. Okay, much to update. Good stuff too. Kevin has been off any breathing machines for over twenty-four hours. He's on flowby or wallflow air. It's basically just room air with adjustable oxygen (right now he's on 50% oxygen). They stopped irrigating his bladder about 30 hours or so ago and he has had very little blood showing up, just occassional spots. That should continue to clear up over time. He's only got one antibiotic left out of the three he was on for the pneumonia/infection. It is scheduled to end on Wednesday. Gastro doctors scheduled a peg tube replacement this morning and it was done before we got here. We were pleasantly surprised when we got here and found out about it. Kevin's Critical Care doctor was surprised that the gastro docs could fit it in so quick and do the procedure in Kevin's room. Kevin has MRI's scheduled for tomorrow (which again were ordered by his neurologist before Kevin came to the ER). These MRI's are for the regular recovery process and are of his brain and brain stem specifically. The CC Doctor told us that Kevin has transfer orders ready for him to be moved into a step down unit on the other side of the hospital. However, there has been a waiting list, so we aren't sure when or if he will get moved there before being discharged later in the week. Now, we are actively looking at post discharge stuff like reopening his home care nursing, alerting his doctors, etc… We are going to be requesting more daily nursing hours from insurance. In fact, we were already looking to do that before this sudden experience and had to put it off. Kevin requires more care than the eight hours of nursing he has been getting. Please pray for this need. Kevin will also be getting a short break from physical, occupational and speech therapy. We haven't yet decided when in March he will start back up, but we will also be discussing this with his doctors as we make the decision. Prior to this hospitlization, Kevin has continued to do new things in therapy and his therapists have so great and creative as they stimulate and improve Kevin's functions. His body control continues to get better. He has stood assisted by therapists, and increased neck control to where he can hold his neck up to 17 minutes long once. Back in June, his record for neck control was only a few minutes. He still needs to do this more consistently, but the increase is exciting. In August, we took Kevin for a swallow study which tracked different thickness of liquids as an Xray showed which of his muscles were/weren't working. This study gave Kevin's speech therapist the information needed to know which muscles in the back of his neck needed stimulated to improve swallowing. She has wanted to schedule a new swallow study so that we have a benchmark for comparison. This ICU stay may give Kevin a little bit of a setback, but as you can probably tell (or already know) Kevin is a fighter. Two steps forward, one step back is still progress. Thanks for all the notes that were sent through the hospital website, we read them to him today. The ones from February 9 & 10 just got here. Feel free to keep sending them and we'll keep reading them to him. The link is http://www.sjmc.org/general.asp?id=322&siteuse=11 and you can fill out the form. There are fifteen of them taped to Kevin's wall. Just finished meeting with Kevin's Critical Care Doctor. Both of Kevin's Critical Care Doctors have been great. We have appreciated their patience and teaching as we went through a difficult situation. We have been able to relax due to the entire staff in the CC unit. His doctor said that Kevin is doing well and definitely making progress. He is not septic anymore, and now we are just basically finishing up the treatment for his pneumonia. Earlier in the week he had told us about Kevin's X-rays which showed a lot of fluid in his left lung. Today's X-rays were great. They are absolutely clear. It shows too, because Kevin has not been coughing near as much the last few days. Kevin's progress off the CPAP machine is going well too. With the low settings that I told you about in the previous update (8 Pressure and 30% O2), he is now just needing to tolerate this well. What that means for prayer terms is that he is breathing around 30-37 times per minute now, and he needs to slow down to the 20's. His doctor thinks by tomorrow (Sunday) or Monday that Kevin will be able to switch to flowby. No real concern left on the light amount of blood in his urine, hopefully that continues to resolve itself. The doctor is thinking Kevin will stay in ICU until Monday. Then maybe between Monday and Tuesday, he will be switched to a step down unit that is outside of Critical Care. Please be praying for the doctors that Kevin will have in that department. We had asked the doctor earlier in the week to take a look at Kevin's peg tube and see what he thought about replacing it. That should be something that can be done Monday or after next week. Also, I mentioned to him that Kevin is overdue on some MRI's that Kevin's neurologist is wanting. The CC Doctor thinks that can be done around Wednesday next week. We started trying to schedule an MRI back in early December so this will be a great help to get it done now too. Today continues to bring good news for praise. After trying a little last night, to wean the pressure support (I misadvertently said previously they were reducing the PEEP setting, but I meant the pressure support), Kevin has made great strides today. They reduced the pressure support settings on the CPAP machine from 14 to 8. They've also lowered the oxygen amount to 30%. Once Kevin is tolerating these levels well, they can switch him to flowby getting him closer to regular breathing. This morning also brought the news that Kevin does not have Cdiff. He is still having a little blood in his urine, but overall that has improved tremendously since they replaced his catheter and started irrigating his bladder. We talked to his doctor about changing his feeding tube. If you'll remember, we went in to change it back in September and the doctor said it just needed cleaned out. It has deteriorated more since then and we hoped they might be able to change it. His critical care doctor didn't think this would be a problem, once he got stabilized. Taylor, Kevin's daughter, arrived from Midwest City yesterday afternoon. We spent the evening together as a family and went back to visit Kevin once the visiting hours started again. Today, she went up to the hospital in order to give Angie and I a break. Thanks Tay! Thanks so much for your prayers on behalf of Kevin and our family! It means so much. Thanks for reading and praying!!!! Kevin is continuing to improve. We spoke with his doctor this afternoon and feel really good about Kevin's progress. He has been on CPAP settings on the vent for about 33 hours now with no problems. An hour or so ago, the doctor started lowering the pressure from 14 to 12 (PEEP) on the vent. After a couple hours, if he seems to tolerate it, they'll lower it again. They'll keep doing that and when he is tolerating an 8, they can switch him over to flowby. For the past couple days, Kevin has been getting food through his feeding tube. It is the same formula that he gets at home, that is jevity 1.2. For the infection in his body and pneumonia, Kevin has been getting three different antibiotics. Vancomyacin, piperacyllin and another more generic antiobiotic. While these are helping with his infection, there is a side effect too. There is potential for C-Diff in his colon. He had it at Saint Francis and Meadowbrook a year and a half ago, which makes him more likely to get it again. They tested him for it, and we should find out tomorrow. The doctors' focus had shifted onto the blood in Kevin's urine. Last night they took three steps towards diagnosing it. First they changed his catheter. Next they tried irrigating his bladder. Then they took him for a Ctscan. When they changed the catheter, they found that it had been put in incorrectly when he arrived in the ER. The urologist said just that could have caused the bleeding that we have been seeing since arriving (especially since his blood was too thin). The irrigation has been flushing any blood out of his bladder, and right now the blood is very faint. The ctscan showed nothing of importance and therefore would not need to do a scope based on the ctscan. We are starting to have more routine with Kevin again. Physical therapy has been coming by each day to work out his muscles and keep him from getting rigid. When they bathed him last night they also shaved him. He was starting to get scratchy barbs on his face so it was definitely time for a change. For about 36 hours Kevin has been completely off of dopamine. That was the medicine used to raise his blood pressure to regular levels. His blood pressure has stabilized and is doing good. Right now, it is 100/65 with a map of 78. Looking good. Of course, we didn't know what to expect from the weather and we ended up getting 5.5 inches more snow. It seems to be more driveable than the sleet driven snow last week. Glad we weren't 40 minutes to the Northeast, they got 25 inches!!! So, Kevin and I have been fairly isolated today as far as external visitors go. There have been several staff that have stopped by. The chaplain, a little elderly nun, came by and introduced herself. She told me that she has seen us the past few days and told us what great condition Kevin is in for Home Health Care. She then proceeded to pray for him silently. Then the Family Care Specialist came by and introduced herself. She said she only started a couple days ago and was there anything that the family needed. I told her that most everything was great. The biggest hangup we have had is the visiting hours. Visiting hours are closed until 6-9AM; then 6-8 PM and finally 10-midnight. We've had a couple come up and not be able to see him during those hours. Rene, the nurse manager came in and introduced herself too. While I was out (due to visiting hours being off), she brought by an approved power strip for all my electronics and laptop. Earlier I didn't know who brought it in, the current nurse just told me it was there to use. Dopamine/Blood Pressure - As far as getting him off dopamine, we slowed down. Part of the issue is that we got a new nurse today, not a bad one, just new to Kevin. During the night, the night nurse had got Kevin down to 2 mg of dopamine. The day nurse hadn't been on more than an hour or two when she saw his Blood Pressure levels hovering near the low side and she bumped up his dopamine from 2 to 5 mg again. It took me several hours to get her to try to reduce it again. She has now his Blood Pressure is doing well and he is getting 4 mg. Hopefully, we can keep taking ten steps forward and only two steps back. Not sure where it is at, but Kevin has put on some extra weight. He weighs 205 lbs. Before this trip to the hospital he was around 194. So that means he has picked up ten or eleven pounds, although there is the possibility there is a difference in the bed scale and the therapy scale that we normally use. Ventilator - Twice now they have switched the ventilator so that Kevin is breathing on his own and the vent is helping him. Twice they have stopped it very close to breathing treatments. This is normal at home and normal for Kevin to have increased breathing rates and coughing after a breathing treatment. The doctor said they will keep working on it and not have the knee jerk precautionary reactions. To do everything he can to at the very least get him on flowby (room air). Today, Kevin has been awake for several hours. Probably 4 hours so far. I have talked with him and put different shows on TV on for him. We also found out that they might be some sort of blockage in his urinary tract, but not bad, he is still urinating. The doctor is getting a Urologist on board to come see him tomorrow. His echo came back fairly good for his heart. He just had some pulmonary hypertension on his right side. But its not bad and nothing can really be done about it. Just finished speaking with one of his critical care doctors. Both of them have been great so far, Dr. Taneja and Dr. Suku. We talked about thirty minutes. At the end he told me that he has done this for a long time and that he has seen many chronically trached patients like Kevin and that he has never seen a family more invested or educated about their family member's situation and what to do to help. Makes ya feel like you are doing things right. The doctor also said that Kevin is winning. Tonight, in preparation for the upcoming winter storm/blizzard, we decided that I would stay the night with Kevin at the hospital. That way, in case everyone is snowed in, someone is with him in ICU. They are all very nice here and are allowing me to stay on a couch/bed that is in Kevin's room. Kevin's fever is still gone, two days in a row. His heartrate has become much more normal , right now it is 79 and he's awake (yeah it's 2 AM - he's still a night owl). The medical staff have been weaning Kevin off the dopamine, which is to combat low blood pressure. They have lowered the dopamine from 15 mg yesterday (Monday) to 3 mg by this evening (Tuesday). His blood pressure is remaining steady and keeping up with the changes in medicine. Also, this evening they have started weaning him off the ventilator. All evening he has been initiating all his breathing and the machine only helps if he doesn't take a deep enough breath. Because of the pneumonia, his breathing has been more shallow. Yet, even with the changes in the ventilator, his lungs are keeping up, for 9 hours so far. After his most recent breathing treatment, he needed a break so they switched back his vent settings with a plan to start the weaning again in the morning. His nurse tonight, told me that every nurse that comes in to help her do something with Kevin cannot believe that he has been at home with home health care. They have all said the family is doing an excellent job caring for him. They can see it in his skin and the lack of any pressure sores whatsoever. And this morning when the physical therapist came and did and evaluation on him, she said that he has excellent range. They are now sending techs to come and do range of motion even while in ICU. Apparently, at first Kevin's kidneys were not functioning good after we arrived here. Now Kevin's kidneys are functioning well, so they started giving him food through his peg tube. We spoke with the doctor about the possibility of changing his peg tube while we were here at the hospital, since his is approximately one year and five months old. Once things get stabilized they will look into that. He still has blood in his urine that is unaccounted for, however it is lessening. They would still like to know where it is coming from. There is a plan to do an ultra sound to see if he has any kidney stones sometime soon. Tomorrow they plan to restart provigil (at home we use nuvigil), which is an alert medication. However, throughout the day today it has been more alert than yesterday. And as normal, wide awake about an hour ago in the night. If you would like to send cards you can get the address at St John's website. However, you can also do this digitally by clicking the following link http://www.sjmc.org/general.asp?id=322&siteuse=11 and filling out the form. Kevin is in room 809. We have a wall that we can tape any cards up, cheering Kevin up in the process. We know it’s been a few months since we've done an update on Kevin. Life has moved forward. Angie and I returned to Italy to pack up our house and close out our aspect of the ministry that's still going on there. We had a great Thanksgiving, Christmas and New Year's at home with Kevin and the rest of the family. However, I'm writing you from an ICU room at St John's Hospital in Tulsa, Oklahoma. It's been a whirlwind this last week, so I'll try to update you quick and get to the prayer needs for Kevin. finally Kohl all got the flu. With the blizzard last week and record-setting snowfall in Tulsa, we didn't have nursing. I found myself caring for a housefull of sickos and Kevin. Fortunately, Brandon was able to come and help some days, because of being out of school due to the snow. We thought we had made it out of the woods but Saturday night things took a turn. Kevin has spells of coughing, but it will eventually be resolved with one of several methods of care. He started coughing at 9PM Saturday night and continued coughing, getting more incessant and worse over the next seven hours. We ran through the checklist of everything we were taught to do in order to relieve his coughing (cough syrup, saline breathing treatment, repositioning, xopenex breathing treatments, etc….). After calling a couple medical professionals, we followed their advice and called 911. On a normal day, we could have just taken Kevin in the van, however, there is still so much snow on the ground and driveway that it was not possible. Firemen and EMSA (ambulance service) arrived and got Kevin ready for transport. Angie rode in the EMSA truck and I met them at the hospital driving in the snow in the early hours between Saturday and Sunday. After some time in the ER, we found a rapidly rising temperature (at home it was 99) of 102-103. His blood was way too thin. His potassium was very high. Kevin’s blood pressure was dangerously low (at the lowest I saw it was 69/39) and his oxygen levels were dropping. He had blood in his urine and had thrown up some as well. Kevin’s heart rate and breathing rate were very fast. Yesterday afternoon, they moved Kevin into an Adult ICU room on the 8th floor. A vitamin K shot was given to combat the thin blood, electrolytes for the high potassium, dopamine for the low blood pressure, O2 for the low O2 levels and Tylenol for the fever. They found pneumonia and some sort of infection that made him septic. Septic is an issue where the blood is infected. This made the staff use a Septic protocol of constant testing to insure the various levels of his body’s statistics. During the night (last night), Kevin’s nurse called to tell us that from a blood gas test, his O2 levels were too low in his lungs and his Carbon Dioxide (CO2) levels were too high. They needed to put Kevin on a ventilator in order to keep the infection from winning in his lungs. Since then his blood gas levels have been good. Kevin’s fever is now gone. His heart rate is much more normal now. With the dopamine his blood pressure is getting back to normal, although to wean him off the dopamine it needs to become stabilized. This morning, after we got here, Kevin cracked open his eyes and even turned toward me when we came over to his bedside. He immediately went back to sleep, but that was good since he hadn’t opened his eyes since getting to the hospital. Several other times today, he has reopened his eyes, twice with visitors and a couple others just with Angie and I in the room. Even though he still has some septic symptoms, he is no longer under the septic protocol. As things progress, we will update you via email, facebook and the prayforkevin.com website. More up to date info can be gotten by following me on Twitter (username mcrosser or pray4kevin) and my Facebook status. Thanks so much for your prayers and thoughts. No flowers or balloons can be sent to his ICU room, but please feel free to send cards to Kevin Crosser, room 809 at St John’s Hospital in Tulsa, Oklahoma. This is a combination of two updates – one from Angie and one from me (Matt)…. Since our last update much has happened. Kevin went in for surgery on September 3, 2010 to have his feeding tube replaced. They ended up saying that it only needed cleaned out and not replaced. So he was in and out in no time! The splints we requested for Kevin’s wrists and ankles were officially denied. There is no more appeal to file. We are now looking at some other splint options as his ankles and wrists still need splints. Kevin has increased tightness causing shorting of the muscles in his ankles and wrists and splints would help to stretch those muscles and even lengthen them again. Kevin has continued going to therapy twice weekly. We have seen increased muscle and ability in his core allowing him to hold himself up for a minute or two on the side of a mat unassisted! He has also started having some of the largest responses we have ever seen in his legs. When tickled or uncomfortably stretched on his feet or legs he will pull his legs away in large movements! This is great because the muscles and the brain are talking! Even though he is not yet purposefully moving his legs this is a good first step! Kevin has been in really good health the last few months. He has not been on antibiotics for over two months! That’s a record since his accident! He continues to make leaps and bounds with his ability to have his trach capped and breathes only through his upper airway. He now is capped twice daily for 4 hours each! He seems to have no problems with this so we expect him to continue to grow in this area. The most recent news is that Matt and I (Angie) are leaving tomorrow for Italy for two weeks. We are going back to finally pack up our apartment and move back to the states. This trip has been a long time coming and it’s great to finally be able to go. We are looking forward to seeing friends of ours there in Italy as well as bringing some closure to that part of our lives as we move back. Our being gone means we have many family and friends stepping in to fill the holes that we will leave while we are gone. The family is paying to have night nursing while we are gone so family will only have to cover 8 hours of Kevin’s care daily while we are gone. So many people have stepped up to provide meals, rides, driving the van for Kevin, taking care of our ministry finances and so much more. Our family continues to be blessed by the Lord who provides us with so many people who love us! Matt and I are able to leave knowing that Kevin and his kids will be completely taken care of…what a blessing! Please continue to pray for Kevin’s complete recovery. Although it is a slow process we hold on to the knowledge that God can and will completely heal Kevin! How do you think the Shoemaker felt when he came out and saw that Elves had worked all night making shoes that helped him when he was struggling to make ends meet? Grateful? Humbled? Thankful? Filled with joyous relief like a weight was lifted off his neck? That is much like we felt after a group of “elves” from American Airlines and the United Way came out on the Day of Caring. When my brother, Kevin Crosser, was in a car accident we didn’t know what the immediate future held. After a few months in medical facilities he was able to come home, that is with round the clock care during a long term recovery. My wife and I moved in to care for Kevin. We also have the joy of helping his kids, as they also help care for their dad. This large commitment means that many other projects have to be pushed off into some unknown date in the future. That’s where this great group of volunteers came in. Many of the projects they completed were things that were needed but we had neither the time nor experience to do them. Some of the projects help us care for Kevin’s home, as we care for him during recovery. All the projects make it easier to help Kevin and without their help, we don’t know when they would have ever been done. A covered deck, that rain or shine can be used to expand Kevin’s view and stimulate his senses. The sump pump removes the flooding waters that existed after every rainstorm, reducing the number of mosquitoes making the backyard safer for Kevin and the family. The privacy fence allowing for more intimate family time with Kevin and the possibility for other ways to care for Kevin. The storage building keeping secure the tools needed to maintain a clean, useable yard. And completing it was the multiple finishing touches that the crew took extra effort in doing. Much as the Shoemaker would have been, we are grateful, humbled, thankful and filled with a joyous relief because weight was lifted off our shoulders. We know it is a monumental task caring for someone who has a recovery ahead of them like Kevin, yet we are not naïve enough to think we can do it all alone. We need family. We need friends. And we need those who might sacrifice time and money to help those in a difficult situation. Thank you for what your sacrifice has meant to this family. Kevin is going to St. Francis Hospital here in Tulsa for an planned outpatient surgery today at 12:40pm. He is having a new feeding tube put in. It shouldn’t be a big deal and should be fairly quick. All surgeries have risks and so your prayers are appreciated!! Please pray there are no complications before or after surgery. Thank the Lord for Dr. Nightengale who has done an amazing job with Kevin in the past. We are so happy to have him do Kevin’s surgery again. Please pray that God will bring a great respiratory therapist to work with Kevin before, after and during his surgery. We received two days ago that said the splints for Kevin’s hands and ankles have been denied yet again. It is very frustrating to deal with insurance sometimes. Kevin’s therapists, general doctor and his neurologist all agree these are the splints for him but the insurance won’t pay. They say that in Kevin’s case they are not medically necessary and that the Dyna Splints we have requested are still considered experimental for someone in Kevin’s condition. Please pray for wisdom as we decide what to do next. Please also pray for Kevin’s hands and ankles that continue to get tight and have muscle shortening with each month that goes by. Usually Kevin goes to therapy on Mondays and Fridays. He won’t be going to therapy tomorrow since he is having the surgery and he won’t have therapy Monday since it is Labor day. We will be working on things more intensely here at the house to try and make up for those missed days of therapy. It was one year ago this day that our lives changed forever. We all remember where we were when we heard the news that Kevin had been in an accident. Even typing that line evoked strong emotional feelings. That's why as we approached this date, we were filled with apprehension and uneasy feelings. How would we treat August 20th? Would we let it pass by while ignoring the feelings that might arise in every quiet moment or would we only mark it on the calendar as some sort of milestone? Then a friend mentioned the idea of fasting. After we thought more about it, that seemed like the perfect way to spend this day that has brought much pain and change to our family. We decided to fast as a family from sunrise to sundown. Tonight we'll break the fast with a dinner together. The discipline of fasting is designed to put a pinpoint focus on a specific prayer topic and/or become closer to Christ. Anytime we feel hungry during the fast it will prompt us to pray for Kevin's continued healing. Through this act we place our trust in God and affirm our belief that God has power to move in Kevin's life. So if you would like to join us, we welcome it. I do not like publicly sharing that we'll fast today. Ordinarily, I prefer keeping it between myself and God. However, we saw this as an opportunity to invite you to share in a great opportunity to focus on God today with or without the fast. You don't have to let us know if you are fasting, but we welcome your prayers this day. As for other news, Kevin has continued progressing slowly. This was also noted by our most recent visit to our neurologist. Both he and our general doctor are trying fervently to battle our insurance for much needed splints for Kevin's hands and ankles. Kevin's hands and ankles are not completely stiff (aka constricted), but if left alone could end up that way. That's why we must continue doing range of motion with his joints and also why he desperately needs the splints. They are called Dynasplints and are made to slowly increase the angle or range of Kevin's wrists and ankles. He would only have them on at night while he sleeps. Pray that the insurance approves them while we await the results of an urgent appeal next week. During physical therapy, Kevin has moved forward in his abilities, if even only slowly. They work with Kevin to grasp a softball and then release it. Also, while they held up his arm, they asked Kevin to move his thumb five times. After two successful attempts, he moved his fingers also. They told Kevin that he had moved his fingers too, so that didn't count. They wanted him to move his thumb three more times, which proceeded to do. They continue to hoist Kevin in a harness in order to increase the amount of weight he can hold up. He has held up 100 pounds of his own weight for about 45 minutes. He's also reached a high point of 120 pounds. That means he can hold up over half of his weight with his legs and body frame. To raise him in the harness he also has to give some effort, if not he would collapse like a noodle. Also, one day they sat Kevin up on the edge of the bench they use during his therapy sessions. They sat him up against a stool to give his back some support. He was able to sit upright with his back against the stool for a couple minutes all by himself. He continues to improve. This past week Kevin went to St. John's for a swallow test. This helps Kevin's speech therapist know what to work on with Kevin. We were able to watch while they sat him in front of an X-Ray machine, so that we could see a live image of him swallowing. This test showed us if he would swallow liquids and foods down his throat to his stomach or let some go to his lungs (aspirate). The thinner items when down well. we watched Kevin's muscles on the X-Ray work to swallow the liquids. The thicker items caused some slight aspiration, (applesauce and pudding), but to his credit, he did not have his trach capped. We weren't told to bring it, so they could only cover it with a glove. They told us he would lose some pressure if there wasn't a completely sealed trach. So, now we have a swallow study benchmark, and just think how well he would have done if he had been capped! In the future, you might start seeing updates coming from Angie too. She will help me get out more regular updates on Kevin's progress. This means they should also be shorter too! Thanks still for your prayers, love, encouragement and concern for Kevin and our family over the past year. Here's to the next year. Rock climbers or mountaineers exercise extreme caution when traversing rugged and dangerous terrain. They use safety lines to keep them past mishaps and when the unexpected happens. Some have asked how we keep going. They ask how we keep happy. Well, I should first dispel the myth that we are so happy that any of us laugh all day long like an idiot. We do laugh.....but we also cry. We get upset, then return once more to joy. We experience the full gamut of emotions, sometimes all in one hour. Yet, there is something that is underlying all those emotions. Something, like a climber's safety line, that keeps us safe and secure. It holds us, as we move forward and up in the face of the unknown. It is beyond just our faith in God. It is based in the relationship we have built with Him for years. We have seen God act in times when there seemed to be no hope, in times when we were completely blind to the future, in times when nothing else mattered and in times of pain and sorrow. It is in this relationship built on the faith and trust in Him that keeps us moving forward past the moments of despair and the periods of discouragement. God will triumph. It's been a couple months since Kevin started going to outpatient rehab at St. John's. He has progressed in many ways, although he still has a long way to go. We take him three times per week, during which he has physical, occupational and speech therapy. During the physical and occupational they have stood Kevin with their help. Recently, they started using a harness, like a climber might wear, to aid in the standing process. By using this method, they can measure exactly how many pounds he is holding up on his own. He has already moved from holding fifty pounds to seventy pounds in a week. The therapists also ask him to follow simple commands and have recently started asking him to do two things at once, such as waving his hand and moving his head. They have challenged him to wave his hand and in response he has moved his arm. Last week, they placed a scooter under his foot, with the eventual goal of kicking the flat scooter across the room. He hasn't kicked it yet, but they could see the muscles moving in his leg as his brain processed the command. Some days, he seems completely out, asleep. Others he is very alert, able to track people with his eyes, turn his head toward sounds or the opposite direction when asked. They have been getting him used to controlling his own body, having him hold his own head up when asked. He could only do this a few seconds in the beginning, but has done it for several minutes now. At first, he could only do this leaned back in his chair, however now he has done it in a more upright position. This is all progress in the right direction. During the speech therapists turn, she uses lemon swabs to facilitate reaction in his mouth and flash cards to ask him questions. He'll squeeze her hand to answer one way or the other. Sometimes a squeeze is a slight pull of one finger, other times he uses all fingers as well as his whole hand. We have added many smells to his evaluations, such as banana extract, licorice, etc.... The speech therapist has challenged Kevin to go from responding with a one syllable "ahhh" to two and three syllable versions ( "ahhh-ahhh" and "ahhh-ahhh-ahhh"). He also also said "hi" more frequently when asked, even though we can tell it is difficult for him to produce the sounds. Often he will use a cough immediately prior to producing a sound to get the volume up. In the past couple months, we have brought a neurologist aboard who has already ordered an MRI and EEG. Those tests now done, have already brought us interesting and positive results. On Kevin's EEG it showed slow activity only in the areas that were received trauma, the rest of his brain is functioning normally. After several attempts to get his MRI taken care of, we finally got it done at Southcrest and the results were encouraging. There was no spinal damage. The neurologist wanted to verufy this after his evaluation of Kevin. The technician also did not note anything about the Brainstem. Now, if you'll recall this was the main area of concern for Kevin back at Saint Francis hospital. The area where his brainstem showed trauma affects, heartrate, digestion, respiratory issues and consciousness. Heartrate, digestion and respiratory don't seemed to be an issue and consciousness only partially affected due to his minimal state. This could be due to one of the other areas that received trauma. On the MRI, the area of Kevin's brain that got the most attention was the right frontal lobe. We won't know how he might be affected, if at all, until he continues to progress. Some other areas of his brain had shown improvement from previous study, which was somewhat difficult since Kevin had not yet gotten an MRI since the accident until this one. The tech and doctor used CTscans and the MRI of Kevin's eye as references (the MRI of Kevin's eye showed some areas of the brain, although not in very much detail). In therapy, they are working with Kevin to hold and eventually drop his drumsticks. Since, he plays drums it is a natural thing for him to work on. Also, they are using softballs in his therapy since has played years of softball. He continues to add abilities to his life. We have a long way to go. Kevin has a really long way to go. Yet, he has come so far. Kevin has progessed and done so many things that we weren't sure he would ever do again. We can't lose heart now! Does that mean every day is roses? No, but as we go forward, not knowing what the future holds, we can rest in the love and care of a God who loves us and Kevin very much. Thanks to those who have sent money for media on Kevin's ipod. Thanks for those who have contributed towards family meals and various expenses. It all means so much. Recently, we asked for some help with putting up a privacy fence, we have gotten some responses on that, but had to put it on hold. It seems we need a french drain or something to help standing water to leave the backyard. We had so much rain this Spring and Summer that it kept the backyard very very swamped. If anyone knows how to put in a french drain or could help us in this way, please email me back. Then we'll move onto the privacy fence. Also, Angie and I still need to return to Italy for about two weeks in order to pack our things and move them back to America. The hold up has been money. Between airfare, cost of meals, and shipping expenses, we are looking at a need of about $10,000. We tried to get a loan to pay for this and we would pay it out over the next five years, but the loan hit a roadblock. If you would like to contribute towards this major expense or if you have any way to help us, email us and let us know. And if you haven't, please come by and see Kevin. Email me to find out how. Thumbs up! 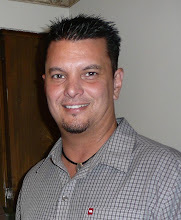 When we last updated you, Kevin had begun therapy at St. John’s outpatient rehab. He also started producing “ahhh” sounds and being more consistent with squeezing his hands. Therapy has continued to go well and there are many things with which to update you. In the past few weeks Kevin has seen several doctors. He saw his general doctor, Dr. Ting, who thought Kevin continues to look better every time she sees him. She took care of some med changes and details, then made our next appointment for two months to give us a break since Kevin is seeing so many docs right now. Kevin saw his pulmonologist, Dr. Kennedy, who changed his trach (always a little blood and trauma, but getting easier each time). She also thought Kevin looks better each time she sees him. She has been seeing him since September 2009. She was happy to hear about the “ahhh” sounds and wanted us to continue doing what we were doing with him at home and in speech therapy. Kevin saw his eye doctor, Dr. Peters, yesterday. This is the doctor who started seeing Kevin about his right eye issue. He was incredibly pleased with how Kevin was doing. He looked at Kevin’s eyes and saw Kevin try to avoid his bright light in each eye. Angie had made a very astute observation about Kevin’s right eye. We haven’t been able to know if Kevin could see out of his right eye due to the exposure issue and trauma inflicted on the right side of his head. She noticed if you brought your finger in front of Kevin’s right eye without his left eye seeing you and placing it directly in front of his eye, he starts to blink, except not so much in his right eye. He starts rapidly blinking his left eyelid. You can see movement in his right, but it is nothing compared to the defensive reaction you see on the left. That means Kevin is able to see something in his right eye, even if he isn’t able to respond as fluidly with his reaction on the right side. In six months we are to return to the eye doctor and he plans on doing some dilation studies and tests. Since leaving Meadowbrook back in December, we have tried to find a neurologist to follow Kevin throughout his recovery. In fact, we were looking fervently for one during the months leading up to Kevin’s discharge from Meadowbrook. Kevin’s general doctor found one, Dr. Richter. In fact, since getting him to sign on, we have found many different connections to this doctor through friends and family. We went to the appointment with low expectations since our experience so far had been abysmal with the neuro field. We were advised that the doctor was older and would take his time. We thought that was good, then we received the advise to get a book. We realized that since he would take his time with Kevin, he would also take his time with every patient prior to Kevin. We saw the doctor about an hour and a fifteen minutes after Kevin’s appointment. We couldn’t have been more impressed. He dove straight in with an examination, choosing not to read other opinions before getting his own history. He is from the old school, using a little hammer to check Kevin’s reflexes. He commented that Kevin must have made much progress to get to this point. In taking a pin and pricking up each side of his chest, he noted that the response wasn’t consistent. He got stronger as he moved up Kevin’s chest. He hypothesized that Kevin may have had some spinal cord damage around the area of the neck fractures. Obviously, it isn’t a complete tear in the spinal cord, since Kevin feels and responds to all kinds of various stimuli throughout his body, but it might explain some things and give Kevin another hurdle to jump over. He scheduled an MRI of his head and neck, as well as an EEG to measure brain waves. He told us to continue playing his favorite music, talking to him and speaking positive of his recovery to him. Then he really blew us away. He pulled out a Bible from the shelf and found a scripture to encourage us. “ 4Rejoice in the Lord always. I will say it again: Rejoice! 5Let your gentleness be evident to all. The Lord is near. 6Do not be anxious about anything, but in everything, by prayer and petition, with thanksgiving, present your requests to God. 7And the peace of God, which transcends all understanding, will guard your hearts and your minds in Christ Jesus.” Philippians 4:4-7. He then left us with this thought. He said, “…and remember Abraham was thankful to God for what he didn’t yet have.” He didn’t want us to lose heart. When he spoke, he spoke to Kevin. He looked at him and us, as if there was hope and listened to what we have seen and experienced. We are so grateful for Kevin’s doctors and therapists. They are truly a team put together by God for such a time as this. Kevin has continued producing sounds upon request while wearing the one way valve. He has tolerated the valve on his trach well and building on his responses and consistency. He has produced other sounds too, such as “H” sounds and various groans and moans as he continues to adjust how to use his vocal cords once more. Kevin’s speech therapist showed us how to put a finger to Kevin’s throat to see if he is trying to produce certain sounds, even if we can’t hear anything. Try holding your finger to your neck and breathe, then try it while speaking….see the difference? Last week, Angie and our nurse that day, heard Kevin try to say “hi” three times. He would cough in and around the words until the third time, when he let out a more normally pitched, “hi” then proceeded to cough as it isn’t easy to make these sounds after so long. They came and woke me up, but he had already used all his energy. When asked to make his sounds louder, he does, which shows comprehension. He tries really hard and then has to take a break. Last week, during one of my night shifts with Kevin, he was slowly turning both his hands by moving them back and forth. He also seemed really alert at 1:45 AM (not abnormal for Kevin before or after). Not sure what prompted me to ask now, but I asked him to give me a thumbs up. You see, some people can discount squeezing a hand, for twitches, even if he wasn’t doing it prior to asking, and doesn’t do it afterwards. But a thumbs up, that means there is comprehension and response. I watched for about five minutes as he pulled his four fingers in to form the foundation of a thumbs up. His thumb lay flat against his hand. As I continued to ask, I saw his thumb muscles twitch. He slightly and slowly moved his thumb. He would try to raise it, but it seemed glued to his hand. Then I saw the amazing quick lift up about an inch towards giving me a thumbs up. His thumb immediately went back down, but I was so excited. I kept asking and asking, kept pushing and encouraging as if I was spotting him while lifting a challenging weight of barbells. I kept seeing his thumb twitch, but only after I asked for it each time. Two more times he raised his thumb up about an inch. At that point I went to wake up Angie. It was the first time, I have ever woke her up at night since bring Kevin home almost five months ago. She came out and saw Kevin responding to my voice and challenge to move his thumb. He didn’t get his thumb any higher that night, but he had most definitely reached a new plateau in recovery. Over the next few days, I repeated the challenge with other family members around like his kids. He would slightly move his thumb, trying hard to get rid of the invisible rubber band holding his digit down. Then on Monday, when we returned to therapy, I shared what had been happening. Kevin seemed very sleepy during therapy, so they spent much energy waking him up, just in time for the speech therapist to come in. Today, we returned to therapy and I dropped off Kevin, Angie and our nurse. I am trying to fulfill my new role with Team Expansion and set aside hours to make that succeed. I have been working on average 40 hours per week since starting in this new role. So today, I went off to a Borders bookstore with free wifi and I proceeded to work, returning about thirty minutes before Kevin’s therapy was over. The speech therapist, who had seen Kevin first today, bumped into me as I was coming and told me how she had come back up to Kevin during his other therapy and asked Kevin to give her a really loud sound and she would leave him alone today. She said about a second later he let a big “AHHHHH”. So she said okay and let him be. I thought that quick accurate response was going to be the big news of the day. I was wrong. I went in to Angie and the therapists excitedly recounting what Kevin had done. He gave them six thumbs up!!! I was amazed. I asked if it was the half lifts, like I had seen and been practicing with him, and they told me know. They said they were full on thumbs up! They said when they would ask for it, he would raise his thumb up and it quiver as he held it for a moment. Then he would let it back down. It was like doing reps at the gym. Awesome progress! We got Kevin an ipod touch for use in therapy. They use it to push him further. They turn on one of his favorite songs then pause it saying they’ll turn it back on if he does whatever they ask him to do (squeeze a hand, make a sound, turn his hand, you get the idea). We have put a couple audio books on it from Audible.com. Yesterday, when Kevin I were here alone, I put a sermon from North Coast Church on for him to listen to and then put ESPN radio on for him to catch up with sports. We have found several apps (programs) to use with him for stimulation and training. We also bought an app which plays about fifty different ambient environments that we can use when he has trouble sleeping (rain, ocean waves, white noise, etc…) or for stimulation (cars, street life, airplanes, etc…). This week I will be putting some voice messages on it that he left us while we were in Italy. Vonage sends voicemails to email and I saved every one of them. This is a way that he can hear his own voice during therapy. If you’ve read this far, I congratulate you and thank you for your love for Kevin, so much that you read my boring dribble to hear news of his recovery. Before closing, I wanted to mention a couple ways for people to help. If you want to buy iTunes gift cards for Kevin, we can use them to buy more stimulating apps, his favorite music and audiobooks. Any denomination is appreciated. Also, we are wanting to put up a privacy fence in Kevin’s back yard. It only needs one side, two neighbors already have them. It would enable a little more intimacy when taking Kevin outside. It would also allow us to create an outdoor shower, which has been done by others and suggested by a medical professional. Right now, Kevin gets bed baths every day, this would give him a new sensation on warm sunny days. Thanks for caring. Thanks for reading. And thanks for praying. I was planning on writing an update that told you it felt like we were moving into the next level of recovery for Kevin. Then something happened this afternoon that cemented this into our hearts and bolstered our faith. Last Friday, we took Kevin to St. John’s outpatient rehab for some evaluations. We were requesting evaluations for physical therapy (PT), occupational therapy (OT) and speech therapy. We had appointments for the PT and OT evals and a doctor’s order for the speech evaluation. We didn’t know what to expect. We have been blessed to have some pretty good therapists for Kevin so far, and you never know if you might get a bad egg! Also, we have yet to have a speech therapist get excited about working with Kevin. Most therapists don’t have the experience with someone in Kevin’s condition, their experience usually comes from stroke victims or something similar. Friday we went in with the hope of getting into regular therapy again (remember our in home therapists discharged Kevin a month or so ago), but the main thing we were there for was the evaluation. We wanted an outside look to see if he was ready for the next level, as well as determine if he needs any preventative splints. The team we ended up with was nothing short of amazing. Great optimistic, hopefully spirits and genuinely excited to work with Kevin. PT & OT were both great (one of them even worked in two brain rehabilitation centers), and the Speech therapist seemed not only knowledgeable, but full of ideas to work with Kevin. They want to see Kevin three times per week, three hours each visit, starting in May. Until then we have a few office visits in April (each Wednesday) and today marked the first. Kevin remained alert the entire time we were at the rehab center. They saw Kevin trying to follow their commands and being successful some of those times. 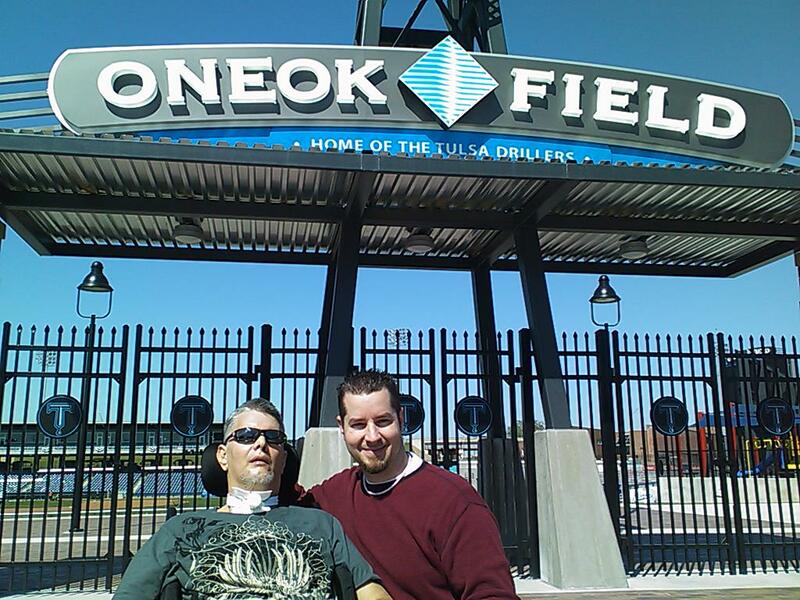 When we left, Angie and I drove Kevin downtown and took him on a field trip to see the new Driller’s Baseball Stadium, OneOK field. We parked and took him over to the fence to see the new field and the Drillers warming up for that night’s second game in the stadium so far. After that, we went over to the Coney Island, a downtown Tulsa institution and a favorite in our family. We got Coneys to go and let Kevin smell them, providing some brain stimulation. After leaving the rehab center on Friday, we were excited, optimistic and recharged about Kevin’s recovery. However, we tempered it with the fact that was our first impression and we didn’t know how the actual therapy sessions would go. Today, was the first session. Kevin, while worn out towards the end, stayed alert the entire time we were there. They lifted Kevin out of his chair and placed him on a large bed/table where they could try different things. They noticed him holding up his head. They felt him squeezing their hand when they asked him. They saw him moving his eyes to look at them in response to them asking him to look at them. Then after his eyes made the journey, his head would follow. He did all these things much more consistently then he was doing them a month ago. His muscles got a workout when they had him sit on the edge of the bed/table, his feet off the side on the floor, with limited support. They did the same things we have been doing, providing some support, leaning him from side to side for weight shifting, but they added something to the mix. They were leaning him forward and back, like he was rowing a boat. At one point, the therapist supporting his back, said I am just giving him a little support to his head, I’m not even supporting his back right now, he’s doing that! After PT and OT did their thing, it was the Speech therapists turn. They put a one-way valve on Kevin to start. If you’ll remember from our days at Meadowbrook, the respiratory therapists used to put this on to listen for sounds and determine if he could tolerate wearing it. It allows air to be breathed in, but he has to breathe out through his nose and mouth. This allows air to travel through his throat creating sounds. The Speech therapist was great. She did several things, such as trying to get Kevin to open an close his mouth. She asked him a few times to squeeze her hand, to which he did a couple times in response. Then she used a lemon flavored swab to see if he would have a reaction to the sour flavor. He did. He didn’t like it too much, moving his head away and making a face. Then came the really cool part. She was trying to get Kevin to make some sounds. She tried several times to get him to say something, to her, to Angie and to me. Nothing. Then she tried again and asked him to make an “ahhh” sound. She encouraged him to open his mouth by touching his bottom lip and to our great surprise he let out a soft “ahhhhhhh”. We were blown away. She asked him again and Kevin responded a second time with “ahhhhhh” softly. The PT that was working with Kevin before was about twenty feet away and working with another patient. She heard Kevin and our response and she told the Speech therapist that she wants to start videoing these sessions with Kevin. I had been taking pictures and decided to turn on the video recording mode of the camera. If he did it again, I would be ready. She proceeded to ask Kevin two more times to make a sound, this time saying she didn’t care if he groaned, said “ahhh” or whatever. Kevin was getting worn out, but he responded both those times too, although it started to be quieter and softer than the first two times. We left the center rejoicing and looking forward to the next time. On the way out, a mother introduced herself to us. We had heard of her and her son. Four years ago, her son had been in a car accident leaving him with brain injuries and in a coma state. The medical community didn’t leave their family with much hope. Their son didn’t making any vocal sounds for several months. And now, he is walking and talking and dressing himself. He is still in rehab, continuing to learn how to walk without a cane and maybe more, but he doesn’t have any memory loss and has come so far. She credits God with how far her son has come. Her message to us….don’t give up! Don’t give up. There will be days and times of discouragement, but don’t give up. There will be moments when no one else understands what you are going through, but don’t give up. So, refreshed, recharged and optimistic we go to bed tonight. Thankful for how far Kevin has come so far and excited to see what God will do through him as we go on this journey. Thanks for reading and caring. It means so much to our family. Last week, we took Kevin to his gastroenterologist. This is the same doctor that put his peg tube in his stomach on September 4th, 2009. This is the first time this doctor has seen Kevin since that day. He came in the room all smiles and greeting us with “How y’all doin?” I remembered that he was overly friendly when we met last September. He also gave us his card and said, call me anytime if you have questions. He repeated that plea this time as well. He told us that whoever is taking care of Kevin’s peg tube stoma (hole for feeding tube) is doing a superb job. He didn’t want to change anything, saying you can’t fix perfection. We left feeling really good with the reminder that we must be doing some things right! We also realized last week that we have now been at home with Kevin longer than we were at Meadowbrook. What????? That sounds as crazy in my head as when we realized it. It seems like we were at Meadowbrook for a lot longer than we have been at home. Part of it is because we had to get renewed each week with insurance and the doctors at Meadowbrook. Another reason is that it was newer, or rather more raw to deal with. Also, we were constantly running, either to pick people up, or from hotel to the hospital, the house we stayed at to the hospital, etc…. During that time, we also visited thirteen different skilled nursing centers which added to the stress. If you’ll remember there had been the flood at Kevin’s house, which consumed a portion of our time too. Things have started to settle more and more. Now we are getting used to the new normal. The end of March saw the end of the medical furlough that Angie and I were on from our ministry in Italy. After much prayer, consultation and thought, we came to the conclusion that it would be God honoring to stay in the states and care for Kevin and his kids. So, we transitioned out of our role on the team in Verona to a stateside role with our mission organization, Team Expansion. I am now part of the Creative Arts department of our mission. I will actually be doing many things that I have done for the past eleven years, but now my talents will be made available to any of our organization’s 320 missionaries on the field. I have done and will do graphics, video editing, web designing, publishing, curriculum creation as well as other creative projects. I will be doing half my hours at a borrowed office at Highland Park Christian Church, and the other half during my night shifts with Kevin. This is still a position where we have to raise all of our support. This is the practice for everyone within our organization. We have updates and prayer updates for our role in missions. If you would like to receive this, please let me know and I’ll add you on. Email me at mcrosser@teamexpansion.org. Kevin finished one of his antibiotics and the other finishes tomorrow. He is coughing much less and producing less secretions. We continue to take him outside several days of the week and on Easter we took him over to my brother, Greg’s, house. We took him outside, so he could watch us hide and find Easter eggs with the kids. Then inside we let him smell the Easter lunch for brain stimulation. We got him back home after about four hours and we didn’t have to suction him even once. Thanks as always for reading this, caring for our family and praying for Kevin’s recovery. Kevin has been improving since going to the pulmonologist. She put him on a couple antibiotics due to two strands of pseudomonas (which he had at the hospital so this is a flare up) and moraxella catarrhalis (this is a common bacteria that causes sinus infections, bronchitis and pneumonia). He has been steadily improving in the past week and a half. He has been on the antibiotics for about six days and is supposed to be on them until the tenth day. 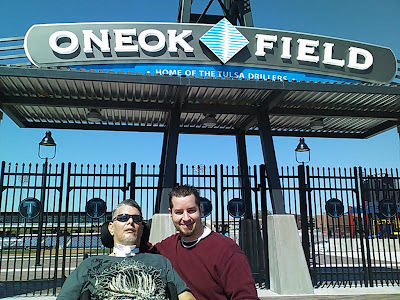 We have been taking Kevin outside in his wheelchair, when it is not snowing or storming (Oklahoma weather is amazing – in one week period rain, snow and sunny days in the 70s). We also were able to take another field trip. This time we packed up Kevin’s gear, loaded him in the van and went to my brother Greg’s house. It was on a late Sunday afternoon and Kevin did great. We only had to suction him a few times and we were there for about four hours. He was in his chair for about five hours. The family has thought about other field trips Kevin could go on, parks, movies (later) and maybe other places he is familiar with. That was one of the things that was good about going to Greg’s house, it was familiar. You are probably saying, but wait he is in his own house! Aha….remember the flood in Kevin’s house?? It ruined enough furniture and things that many of the rooms, while the same shape, are very different. In the past week, Kevin has kind of popped open his eyes, staring off at the room and seeming to be anxious, like he doesn’t know where he is. Family members have taken the opportunity to soothe him and tell him he is at home and his body language calms down. Today (Wednesday, March 24) we took Kevin to his general doctor. Can I just say how blessed we feel to have the doctors caring for Kevin that we have? They really are amazing. His doctor today said we were doing a great job with Kevin at home, that everyone in the office commented that they thought Kevin was looking better and they were excited to see Kevin roll in the office sitting in his chair as opposed to an ambulance gurney. His doctor took her time with Kevin and us, examining him and answering questions that we had. She also ended up giving him an allergy shot, since Kevin used to get those on a semi-regular basis. Maybe that will also help with his secretions. I am flying out of town overnight from Thursday to Friday this week. Please pray for the family skeleton crew while I am gone, stepping up and filling holes. Please pray for wisdom as we make decisions for Kevin. Please pray for joy as we go through an incredible situation. Please pray for steadfastness and we trust in God to carry through these times of trial. And especially pray for Kevin as he heals, progress and goes through this monumental ordeal. So, in a couple days, Kevin will have been home for three months. After almost four months an answered prayer arrived at Kevin’s house….his wheelchair. It is really nice, and a much better fit than the “one-size-fits-all” geri-chair. We are glad to get rid of it. We’re calling the medical supply rental company to pick it up this week. After a week of helping us get used to using the new wheelchair, our two therapists discharged Kevin. He is progressing, but not fast enough for them to stay on right now. They cannot do anything more than they have taught us at this point. As Kevin continues to progress they may be able to return. Kevin had much trauma to his brain, therefore we have to wait for his brain to catch up to his body in healing. He doesn’t have major spasms anymore, he stretches out when awakened, starting to stabilize his head more and more, and able to cough out most normal secretions. Last week, Kevin had some sort of cold that was making his secretions worse. That meant we had to suction him more than normal. He is finally starting to get over it, so he can get back to his normal healing rate. With the wheelchair comes new freedom for Kevin. The first couple days we started to take him around the house and see things like his new kitchen that was built for him. Every once in awhile, as we pointed out different things in the kitchen, he would turn his head in that direction! We were happy he was alert for the tour. Another freedom is taking Kevin outside. Once the weather warms up a little and stops raining, we can take him outside. When Kevin has doctor visits, he no longer needs the assistance of EMSA (ambulatory services) to come and pick him up. Family friends have a lift equipped van and have graciously offered the use of it whenever we want. Friday was the maiden trip and we took him to his pulmonologist. Angie and I, along with our nurse, loaded Kevin up and went to the doctor’s office, then to another location to get an X-ray, finally grabbing some fast food for lunch before heading home. It worked out so well. We are looking forward to our next “field trip”. The lung doctor remarked that Kevin continues to look better. This doctor has been seeing him since September. She said every time she sees Kevin he looks better to her. She changed out Kevin’s trach, causing some bleeding, but not as much as last time. Today, Saturday March 13th, was the last day of our previously approved nursing. We found out on Friday, that Kevin was approved again for another four weeks of nursing, putting the next end date at April 11th. One of our main nurses had to take some emergency family time off, and a new nurse started last week. She has done a really good job and cares for Kevin very much. Kevin has been blessed to have the quality of nursing that he has had at home. We are so thankful. Thanks to those who have brought over a couple meals, it was such a big help and tasty too! If anyone has a standing “A” frame lying around their house, we might be able to put it to good use. I believe it might have to have some specifics, but other than that they are made to fit various sizes of people. Thanks so much for your prayers. Thank you for praying even when we don’t report. Thanks for thinking of us and sending cards, calling or coming by. It helps it not be so lonely and gives Kevin some new stimulation. He’s probably had just about enough of me and the rest of the family! I currently have a beard. I know, I know, you’re thinking…it’s been this long and he’s writing about facial hair? Hang with me, I’m going somewhere here. I don’t always have a full beard, but in certain times in my life, I have grown one. There have also been times where I grew it just because, but most often I have grown one when something big and difficult is going on in our lives. I don’t think I have ever told anyone this before. It’s like my own little nazarite vow with God. I’m not pledging anything to God by growing, except maybe allegiance to Him. It’s the idea that I can relax and let Him be God and take care of not only me, but with any situation that I am confronted. Kevin’s been home at his house for two months. While these have been some very stressful months, they have also been very good months. How do you find goodness in a difficult situation? Well, I do think it is very difficult, if not impossible to do this without God. Relaxing in Him, and letting God be the one responsible is the ideal, which is the daily struggle. We don’t always relax, in fact often we worry and fear and cry and get angry, yet it the times we do trust and truly relax in Him are the best times. Those are the times that we yearn for. Since the last update, we have had nursing approved twice for two week periods. Last Friday, we got approval for one month of eight hours per day nursing. This goes until March 13, 2010. We will request more as that date approaches. We have one main nurse five days per week and another nurse here on the other two days. They are both answers to prayer for Kevin, as is actually having the nursing at all. Physical and Occupational therapists have both continued coming helping see where Kevin’s limits are with the tasks that he is able to endure. Sitting assisted on the edge of the bed has increased from a 20 minute activity to as long as 65 minutes. This tasks is actually limited by those of us taking turns to assist Kevin. Several professionals have indicated that Kevin might benefit from a communication board. This would be something that Kevin could look at and respond to our questions since he is still not communicating verbally. He could look at a certain picture to answer yes or no, or something of that effect. We are hoping that we can find the right Speech Therapist to work with Kevin. We were able, thanks to those of you who responded, to fix the house needs in order to reinstate Kevin’s new home insurance. After three months of struggling with Kevin’s medical insurance, they finally approved Kevin’s wheelchair. It should be here by the weekend. With it we can do all sorts of new stimulation from taking him outside to positioning in the chair and field trips. Today, we took Kevin to his pulmonologist (lung doctor). She was one of Kevin’s pulmonologists at Meadorbrook. She thought Kevin looked very well cared for as well as looking more alert than the last time she saw him. She gave us a great deal of time and attention as well as changing out Kevin’s trach tube right there in her office. She wanted to do it now, since it had been a little longer than you would normally want to leave the same one in. He has had this one the entire time he has been home, plus a week or so prior. It went really smoothly, except that taking it out caused bleeding. Apparently, the longer a trach tube is in (and not changed out) makes it more possible for the skin around it to attach. She remained calm and took care of Kevin’s bleeding. After stopping the bleeding, she said we might see more blood get coughed out in the next 24 hours. He coughed a little after we got back home, but all night so far (from 11pm to 4am) he has only coughed once. She also changed out Kevin’s trach to one that would make it easier to cap and allow him the opportunity to make vocal sounds when possible. This means now we have to clean out the inner part of his trach tube rather than inserting disposable ones. Thanks to those of you who have brought lunch or dinner by for our family. It has been extremely helpful. Also, thanks again for all your prayers, we appreciate them tremendously. Here I sit in the dark on my night shift with Kevin. His room is the living room and I have crashed on the couch. Angie will relieve me at 5 AM and I’ll head to bed for a bit. Kevin has been coughing a little more the last few days, but not too much tonight. Last Saturday, Kevin has been home a month. Five months ago today was Kevin’s accident. We knew the odds were up against him those first few days and weeks, so to think we are here with him, five months later is pretty amazing. Last week, we asked you to pray about the peer to peer doctor phone call. Basically, the result was that Kevin got approved for another two weeks of eight hours per day nursing. It may end then or we may be able to get more extensions, we don’t know, but God does. During the past several days Kevin has done some really cool stuff. I’ve told you about using the Wii and PS3 for therapy and coma stimulation with Kevin. Well, last week Kevin was pushing the button with his thumb a few times and trying a few more, it seemed difficult for him to push it all the way. He has done this a couple times now. One of those times, Kevin’s nurse asked Kevin to squeeze his hand if he wanted to keep playing. Then he asked him to not squeeze if he wanted to stop and rest. Then he reversed the question. Squeeze the nurse’s hand if he wanted to stop and rest and don’t squeeze if Kevin wanted to keep playing. He squeezed consistently to keep playing, even though his eyes were drooping and looked tired! Then that night, we had Kevin in the geri-chair. Our mom was there and she was sitting behind him to his right. The TV was on the wall in front of him and turned on. Angie asked Kevin if he wanted to turn around to see his mom to squeeze her hand. He did. Then she asked him to squeeze her hands if he wanted to stay where he was and watch the TV. He didn’t squeeze. She asked him again and he consistently responded to the questions. Every two hours we need to adjust Kevin’s body position in bed. This is called ‘turning’ him. I have to do this in about fifteen minutes in fact. But last Saturday night, I went to turn Kevin to his left and told him so as I came to the bed. I hesitated because I was making sure that I had everything in place before Kevin in an uncomfortable transition position. As I hesitated, Kevin’s body tightened up, it seemed every muscle was working over-time and he rolled to the left. Every other time, when Kevin has contracted his muscles he stays right where he is making it harder for us to turn him. I was so surprised and I told him thanks for saving my back from turning him! Physical and Occupational therapy each continue to come twice weekly. They are great encouragement and have helped us do new things with Kevin for building muscle back up in different areas of his body. While OT was here today we were having Kevin do different motions with his hands in a pattern across his body. These motions not only help keep Kevin’s joints looser, but also stimulate his memory of doing these type actions in the past. For example, we took and empty spoon in his hand and made the gesture of ‘getting’ something off a plate and lifting it to his mouth. We know Kevin loves Cool Whip and we had some, so we even tried a little Cool Whip to his lips. He didn’t really respond while OT was here, but then after she left, we put a small amount inside his mouth to taste. He began moving his tongue around and chewing! We have also done BBQ sauce and frosting so far, maybe others. Due to the bathroom flood that caused water damage in Kevin’s house, his home insurance cancelled his policy. We searched for another insurance company and thought we found one, but when they did the inspection they told us about a couple outdoor repairs that needed done or the new policy would be cancelled too. If you would be able to repair the roof over Kevin’s front porch, would you let us know? Unfortunately, we are in a time crunch too, but this would be a great way for someone to help Kevin during his recovery. Email me or call for more details (Matt – 918-850-9828 after 11AM thanks). Today, Kevin watched some Star Trek (the original series) while he was sitting up in his chair. We have been playing some Old West audio books by Louis L’amour (his favorite) for him during the morning. In rest times, we dim the lights and play soft music or no music at all. Keep praying for Kevin’s insurance to continue nursing. Keep praying for Kevin’s progress. Keep praying for our family’s unity and sanity. We thank God for everything that He has done so far and trust that He will continue to care for Kevin and our family. Use this blog to keep updated about Kevin's condition, to write notes to Kevin and the family and to, most importantly, pray for Kevin. "My name is Kevin and I shoot striaght. I like to joke around though and enjoy meeting people. My children are the highlights of my life next to GOD. My Mom, Dad, brothers, sister-in -law, and their children are very close to me also. I have many special friends and extended family and they know who they are. I love my job at AMERICAN AIRLINES. I'm a EXECUTIVE BOARD OFFICER for the TRANSPORT WORKERS UNION LOCAL 514. I love softball, hunting, and being involed in the community. I like to help people. I think this is what God intended us to do. I have the honor of setting on several boards. Vision 2025, Redcross Chapter, Redcross Blood Services and recently I've been asked on the INCOG federal reserve Board. I know every day matters so live it like you should." Kevin's Interests: "Community Involvement, Public Relations, Hunting, Fishing, Softball, Lifting Weights Playing the drums, Big Sooner Fan"
"I like all types of music, Christian, Pop, Rap, Country, Jazz, Classic, Rock, Did I leave anything out?"